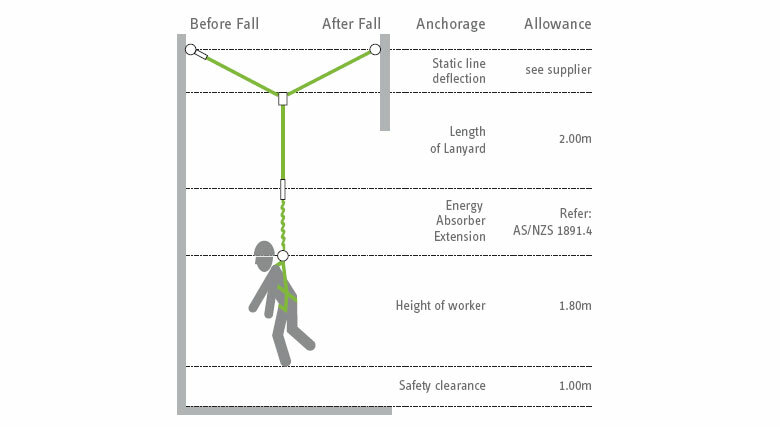 The lanyard and static line fall clearance diagram below provides a visual indication of fall distances and clearances required. When using a temporary static line system in conjunction with a lanyard, users must be aware of the clearances required. Refer to AS/NZS 1891.4 for more information on fall clearances. Ideal for situations where accessibility along a length of an area is required on a temporary basis. 20m Hawser laid 16mm nylon rope. Harip tensioning device for precision tension. 2 person system for fall arrest. Kit complete with split running blocks, web tie-offs and karabiners. Packed into a carry bag for easy transportation site to site. To suit applications in construction, maintenance and roof work. 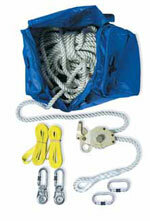 Lightweight 20m webbing temporary static line kit with ratchet tensioner for 2 person use. 20m webbing with ratchet tensioner. Easy to install and remove from site. Complete with storage bag sewn to line. For use of up to 2 people.